This is a brown glazed figure of a man, of the Tang dynasty; 618-907 AD. It is 23,5 cm tall, and made from a white earthenware. It is porous, feels like chalk, and is hollow. The figure was made in a mould, which is visible on the sides, where the mould marks were flattened. 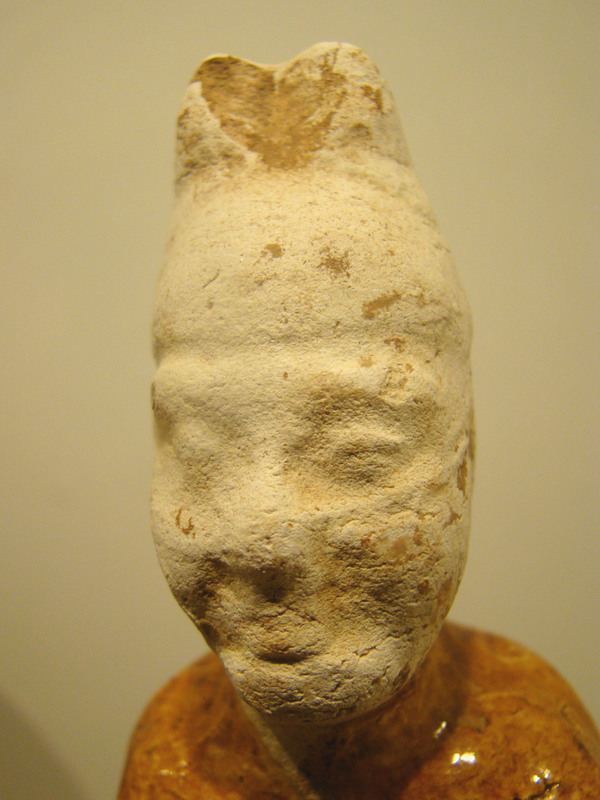 The figure is covered in a brown lead glaze. These burial-gifts are faked in abundance, so be aware ! Handling good pieces is essential to recognize the good from the bad. There is a variety of undersides, but these glazed ones are hollow. The adhered dirt is strongly attached, and naturally dispersed. Most fakes are painted in with dirt. Here a study of the glaze. The crazing is subtle and uneven. At close look the scales lift up a little, and catch the light.